Amorgos Island Magazine | Agios Pavlos Beach – must visit! 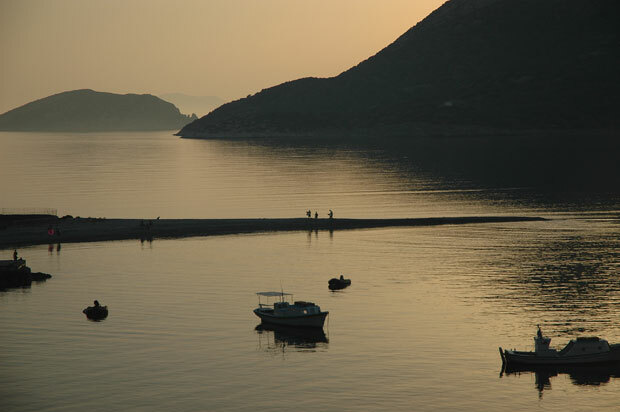 Amorgos Island Magazine > Outdoor Activities > Beaches > Agios Pavlos Beach – must visit! There are places on Amorgos you simply must visit. One of them is Agios Pavlos Beach with it’s “carribean-finger” pointing nearly 100 meters into the sea. The shingle spit is a natural design phenomenon. It is shaped by wind and sea – sometimes spiky, some other time it changes into a small curved bay. However, you will enjoy the mild lagoon-like shore, wind and rough-sea protected by the opposite [intlink id=”island-of-nikouria-beaches” type=”post”]island of Nikouria[/intlink]. For afficionados a hangout refuge and a well liked spot for fishing, diving, snorkeling and anchoring too. Vistor-services are on and around the beach, including a nice tavern, serving local cuisine, and a new pool ground with bar (not completely finished at the moment). Agios Pavlos is also the pier for the 15 minutes boat trip to the island of Nikouria with it’s beautiful beaches. The shuttle service is operated from 11:00 am to 7:00 pm, charge for the round trip is 4 euro each. Agios Pavlos beach can be reached by car and scooter (parking space available) or bus (walking distance from the bus station is about 500 m). If you look for a romantic and quiet place to stay on your Amorgos holidays we recommend Agios Pavlos Studios, a well known close-to-the-sea studio hotel. … for those who definetely want to be alone! Take a short 10 to 15 minutes walk from Agios Pavlos beach southwards and you will find a few small beaches. roussou September 10, 2010	Log in to reply. This place is a DREAM…..
Mihalis January 22, 2014	Log in to reply.